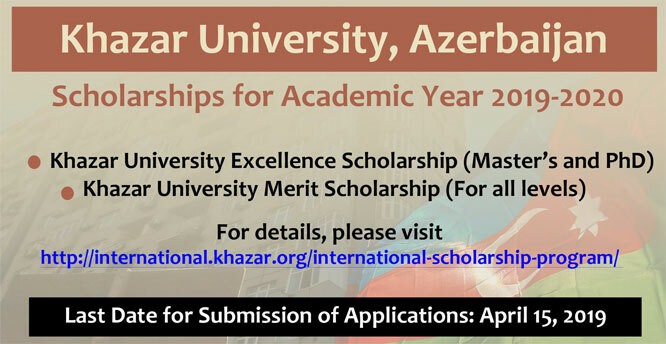 Khazar University announces the Excellence and Merit Scholarships for distinguished international applicants who wish to pursue bachelor's, master's and doctoral (PhD) degrees at Khazar.The aim of Khazar University scholarships is to encourage and support candidates with excellent academic performance from all over the world to study at Khazar University, a leading private university of Azerbaijan that offers quality education in English language. How to Apply for Scholarships. In order to apply for scholarships, you need to apply to one of the programs offered by Khazar University and indicate that you wish to be considered for a scholarship in the application form.